We love everything to do with camping From sleeping on a mat under the stars, bedding down in a camper van or sleeping under canvas. So as far as we’re concerned… it’s all good. It’s good for us to get back to nature and above all it’s good for the environment. So we especially love it when individual and unique companies reach out to people who have never tried camping before and make it easier for them to take their first step into the unknown world of canvas, camper vans and caravans. Something that they may not otherwise have done. To some, this is known as ‘Glamping’… to other’s it’s known as ‘posh camping’… but to us it’s simply a different type of ‘camping’. 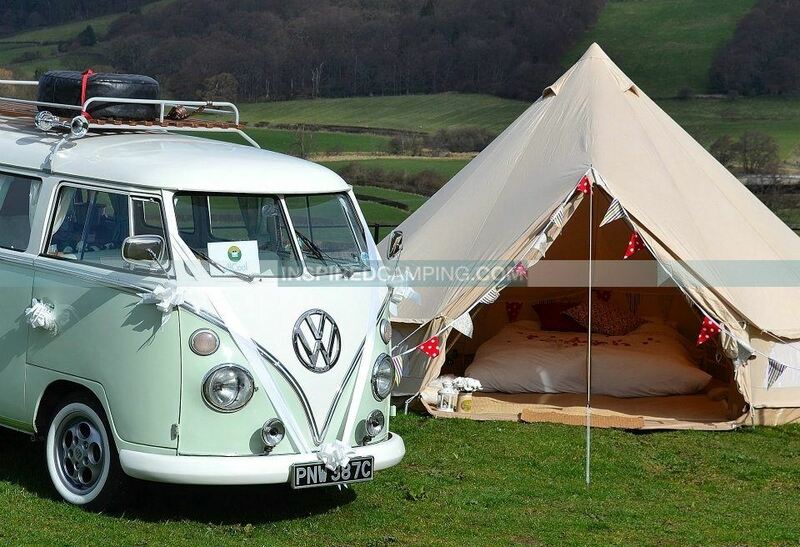 Christina and Lee Hawksworth run one such company in Yorkshire called Glampit. They hire out bell tents and do all the hard work for you. All you need to do is say where you want the tents erected and it will be ready for when you arrive. We caught up with Lee and chatted to him about what inspired them to set up their Glampit business. “As a couple we’re very ‘outdoorsy’. Christina loves nothing more than horse riding and I’m always out walking in the Yorkshire Dales. We’ve always loved camping and getting away to the countryside for a couple of nights whenever we can, but Christina always felt that sleeping on a 1cm thick camping mat wasn’t exactly comfortable and then there was the fact that she couldn’t stand up. Now this doesn’t really bother me, apart from at that time of night when you wake up after a couple of drinks round the campfire (you all know it), and rather than crawl and struggle out of your Aztec Duro Plus tent (which I love), it would be easier to get out of bed as normal and walk out of the door to the bathroom. Glamping has really taken off lately, from being an unheard word a couple of years ago, to something that is tweeted about at least every 5 minutes. Last summer while camping in Somerset, UK,we saw something a little bit special. It was a beautiful canvas bell tent, furnished with rugs, cushions and of course…bunting. It was so different to everything else you see pitched up and it was exactly what we’d being looking for. So as soon as our trip ended, we headed north, got home, unpacked the car and set about trying to source ourselves a new bell tent. We soon found a number of companies on the web that sold them, along with luxurious camping (sorry glamping) accessories, so we went ahead and ordered ourselves one. Glamping has really taken off lately, from being an unheard word a couple of years ago, to something that is tweeted about at least every 5 minutes. From all of our research we found almost everything to do with glamping was based in the South, and Yorkshire itself only had a small number of permanent glamping sites dotted around. None of which were in the places Christina and I would consider our favourite spots. That’s when it hit us. We thought why not rent a glamping package out to people to take to their very own favourite part of Yorkshire? We even thought that if we could put it all up and take it all down again, it would leave people with a hassle free holiday. So that’s when Glampit was born. The idea is simple. You choose and book your campsite as normal, then choose whether you want to rent only the tent or a furnished package (yes, including bunting). You let us know where and when you want us to be there, and you’ll arrive to a pre-erected tent, allowing you to get your holiday started as soon as you arrive. Once the website went live at the beginning of 2012, the enquiries started coming in. The first from a couple wanting 8 fully furnished tents for accommodation at their wedding, the second wanting 5 for their wedding and the third wanting 15 for their wedding. There was a bit of a theme here! We thought it would be mainly for couples wanting one tent for a weekend getaway, so this opened up a totally new and exciting market for us. Since then we’ve had pony clubs, cycling clubs, children’s parties and even more wedding enquiries come in. 2012 is looking like it should be fantastic for us, and we’ve already started to plan a Glampit “thrillaxing” weekend for the early summer, which will involve great walks, tasty food and great company over a weekend somewhere in Yorkshire. We’ve also been working hard sourcing different types of furniture and furnishings for different themes, such as Moroccan. If you run a business that offers a quirky, unique and interesting camping service or product then we would love to hear from you… so simply say hello and get to know us a bit better.